Guest post courtesy of Pixabay.com. Rainy days are as hard on adults as they are on kids. Your children have a lot of energy they need to burn off and getting outside is the best way to do it. Unfortunately, the weather isn’t cooperating today, and it’s up to you and your creativity to find the next best thing - indoor activities that’ll get the kids up and moving. Your little ones can run and jump at will, but that won’t work for tweens and teens. Unless you have a fully equipped indoor gym, it’s time to reach into your bag of tricks and pull out some engaging surprises. Don’t despair - there are many more options than you’re probably aware of. Popping in a video game and letting the kids go at it for hours probably isn’t your idea of physical activity. Before you read on, be aware that there are plenty of interactive video games that are based on physical exercise. Exergames are motion-controlled video games that allow you to control the action by tracking body motion. It’s a form of video gaming that’s used in senior living facilities to keep older adults from falling into a sedentary lifestyle. Your children missed out on the hula hoop craze, so why not introduce them to a fun and vigorous physical activity with a twist. If they’re having trouble getting the knack, dial up a Youtube video so they can learn how it’s done. Hula hooping is a great way to get some exercise indoors, and you can add another element of fun by having a hula hoop competition, the winner being the one who keeps the hoop going around the longest. Remember Twister? It’s a board game in which contestants contort their bodies into different shapes responding to game prompts. If you can keep from giggling too hard you can get a pretty good workout and stretch out several muscle groups. 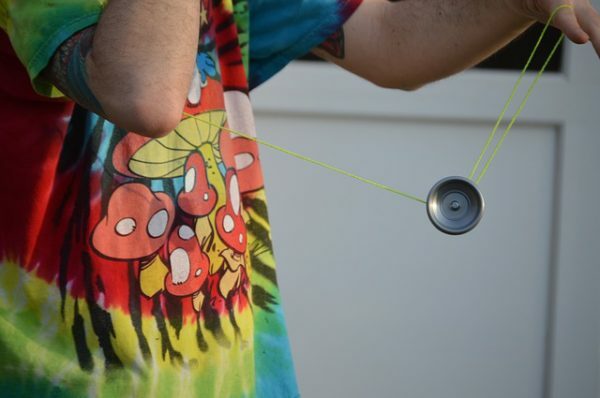 Yo-yos are another timeless toy that’s fun and easy to learn. Would you believe that stacking is a sport? That’s right, a sport. Cup stacking is one of the most popular versions because it requires dexterity and a great deal of focus and concentration. If your kids tend to get a little wild and destructive, stacking is an excellent way to keep them engaged without inviting a brawl or getting them too wound up. Contestants use plastic party cups to create stacked pyramids of six to 10 cups, then stack them into individual columns as quickly as possible. You might be surprised at how difficult it actually is. If stacking isn’t everyone’s idea of fun, try other activities like building with Legos, creating glitter artwork, or making a duct-tape alphabet. If your teen desperately needs cash, why not set him the task of cleaning the house (or at least his room) for a few bucks? It’s a little exploitative, but at least you’re making it worth his while. It’s even better if you have several children. Assign each one a couple of rooms, tell them what you expect and watch them go. There’s nothing like a little pecuniary motivation to get the young ones moving and productive. This one sounds like a variation on Twister. Tie a length of ribbon to two chairs at opposite ends of a room, about 4 feet off the ground, divided into two teams and keep the balloon going with your feet (no hands!). The kids will find out quickly how agile they can be laying flat on their backs. Try making “paddles” with paper plates taped to tongue depressors and try a game of balloon tennis. Check out some free music lessons and drawing tutorials on YouTube. They’re great ways to while the hours away, and your kids may discover they have a talent they never suspected. Gather everyone together for a contest of impromptu storytelling, challenging everyone’s imagination by devising their own stories or collaborating on one as a group. There’s a lot of entertaining activities to be had indoors. The next time the rain keeps everyone inside, try a few of these ideas to keep your kids moving and laughing. You might even find yourself joining in the fun.